Errata Cards are cards which have errors borne of misprints or translation/wording errors. This fix is applied to all types of game formats and take precedence over the original wording of the card. The first print of V-BT03/065EN had the incorrect text printed. and that unit and this unit get [Power] +10000. and that unit and this unit get [Power] +10000 until end of turn. The first print of V-MB01/013EN had the incorrect text printed. …that unit can attack from the back row. …that unit can attack the back row. The first print of V-CS01/005EN had the incorrect text printed. The first print of V-BT02/014EN had the incorrect text printed. The first print of V-BT02/013EN had the incorrect text printed. The first print of V-BT02/001EN SV01EN had the incorrect text printed. 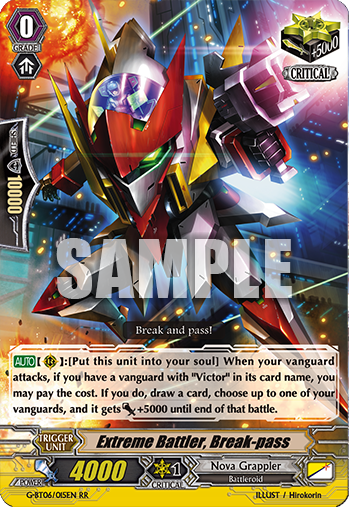 The first print of V-BT02/053EN had the incorrect rarity printed. The first print of V-BT02/031EN had the incorrect rarity printed. This card must be called to an open (RC) when you would call it from your hand. This card must be called to (RC) with a unit when you would call it from your hand. The first print of V-BT02/026EN had the incorrect text printed. The first print of V-TD04/008EN had the incorrect text printed. The first print of V-PR/0435EN had the incorrect text printed. …[COST][put this unit into your soul], and draw a card. 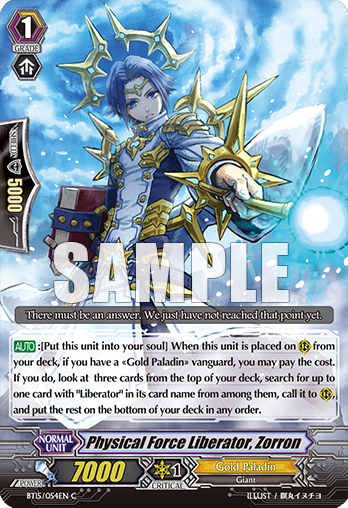 …[COST][put this unit into your soul], draw a card, and one of your units get Power+3000 until end of turn. The first print of V-EB02/016EN had the incorrect text printed. [CONT]:When it would be retired from (RC), you may [Counter-Blast 1]. If you do, return up to two gauges equipped to this unit to your hand. [AUTO]:When it is retired from (RC), COST@[Counter-Blast 1], and return up to two gauges equipped to this unit to your hand. The first print of V-EB01/010EN had the incorrect text printed. [CONT]:When it would be retired from (RC), you may [Soul-Blast 1]. If you do, return up to one gauge equipped to this unit to your hand. 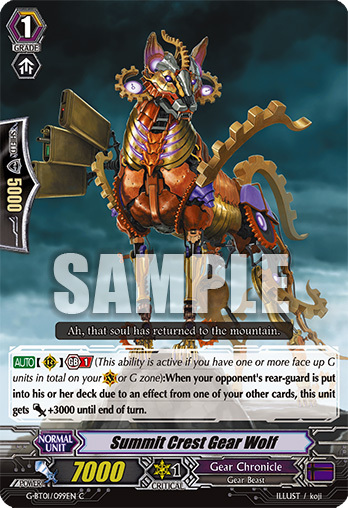 [AUTO]:When it is retired from (RC), COST@[Soul-Blast 1], and return up to one gauge equipped to this unit to your hand. The first print of V-EB01/022EN had the incorrect text printed. The first print of V-EB01/027EN had the incorrect text printed. [AUTO](VC/RC):When its attack hits a vanguard while boosted by “Queen of Heart”, [Cost][Counter-Blast 1], and [Stand] one of your other rear-guards. [AUTO ](VC/RC):When placed from hand, [Cost][Soul-Blast 1], and two of your units get [Power]+3000 until end of turn. If you have five or more units, [Power]+5000 instead of +3000. The first print of V-PR/0022EN had the incorrect text printed. When it boosts “King of Sword”, [Cost][Soul-Blast 1], and that boosted unit gets [Power]+5000 until end of turn. [AUTO](RC)[1/turn]:When a sentinel is placed on your opponent’s (GC), you may [Stand] this unit. The first print of V- PR/0023EN had the incorrect text printed. The first print of V-PR/0004EN had the incorrect text printed. [ACT](RC):[COST][Put this unit into your soul], and one of your units get [Power] +5000 until end of turn. If your opponent’s rear-guard was retired during this turn, [Power] +10000 instead. 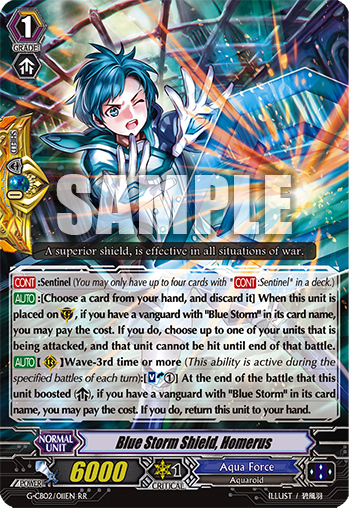 [AUTO](RC):When the attack it boosted hits a vanguard, [COST][Soul-Blast 1], and return this unit to your hand. The first print of V-PR/0002EN had the incorrect text printed. those cards until end of turn. The first print of G-BT14/024EN, S12EN had the incorrect text printed. separate (RC) in the same column. 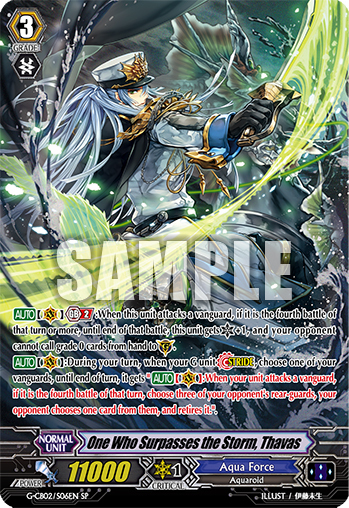 The first print of G-BT14/048EN had the incorrect text printed. 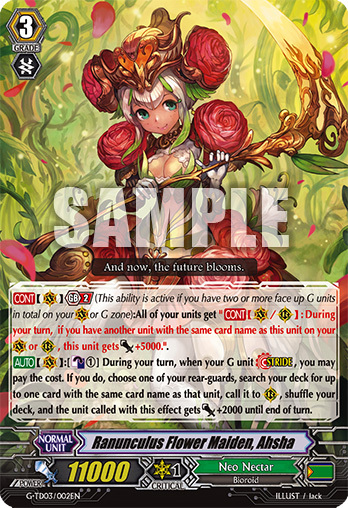 The first print of G-BT14/001EN had the incorrect text printed. The first print of G-EB03/031EN had the incorrect text printed. The first print of G-EB02/002EN had the incorrect text printed. 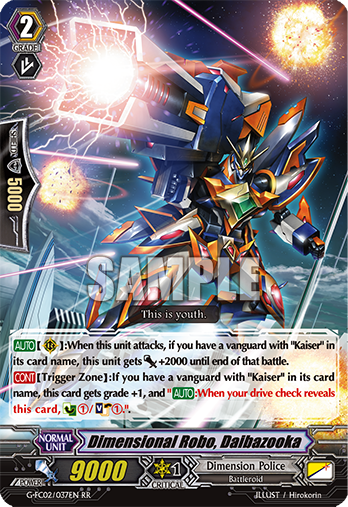 The first print of G-BT13/S05EN had the incorrect text printed. The first print of G-BT13/085EN, 086EN, 088EN, 090EN, 091EN had the incorrect text printed. 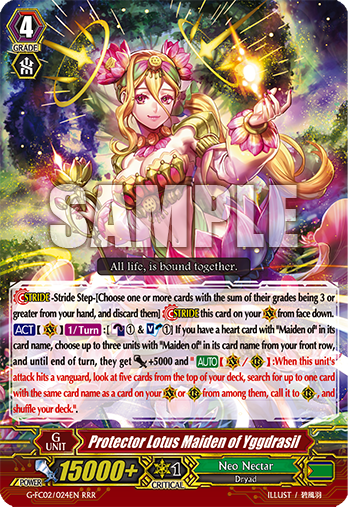 The first print of G-BT13/077EN had the incorrect text printed. 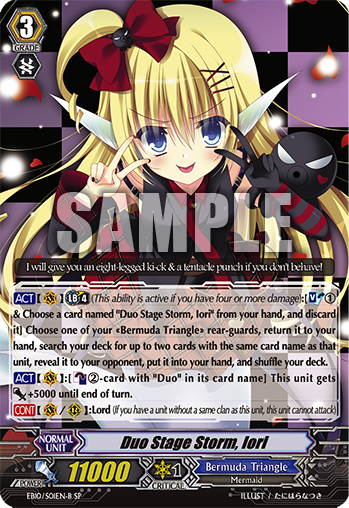 The first print of G-BT13/069EN had the incorrect text printed. 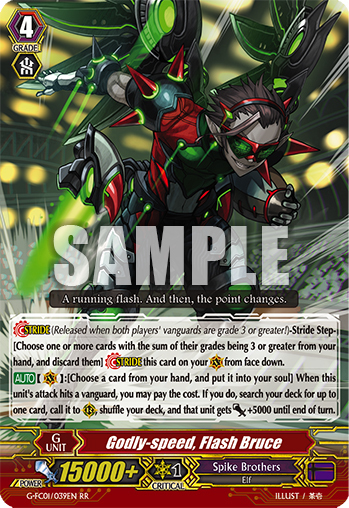 The first print of G-BT13/045EN had the incorrect text printed. 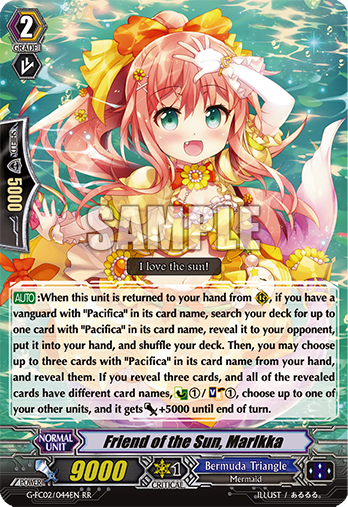 The first print of G-BT13/035EN had the incorrect text printed. The first print of G-BT13/066EN had the incorrect text printed. and heal it. Shuffle your deck. 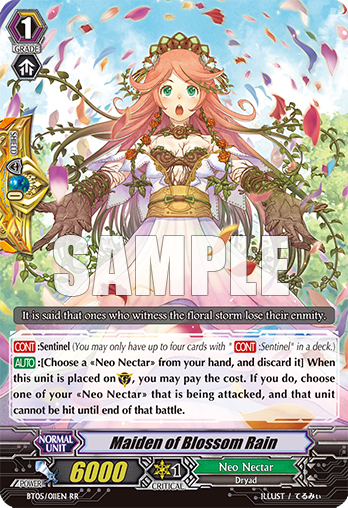 The first print of G-BT13/030EN had the incorrect text printed. opponent chooses one… locked, and locks them. The first print of G-FC04/038EN had the incorrect text printed. 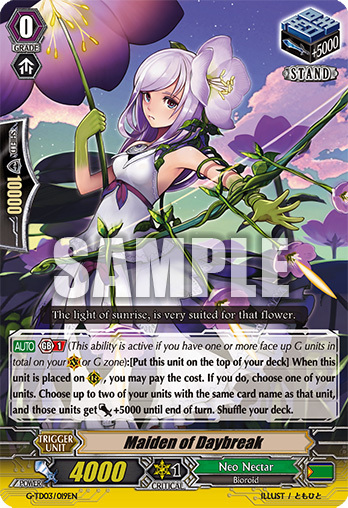 The first print of G-BT08/053EN had the incorrect text printed. The first print of G-BT13/016EN, S10EN had the incorrect text printed. The first print of G-CB05/010EN, S10EN had the incorrect text printed. The first print of G-CB06/026EN had the incorrect text printed. The first print of G-CB06/022EN had the incorrect text printed. The first print of G-CB06/004EN,S02EN had the incorrect text printed. The first print of G-CB06/008EN,S06EN had the incorrect text printed. The first print of G-CB06/043EN had the incorrect text printed. 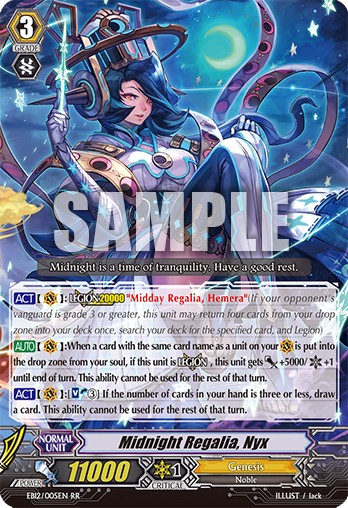 The first print of G-BT12/087EN had the incorrect text printed. 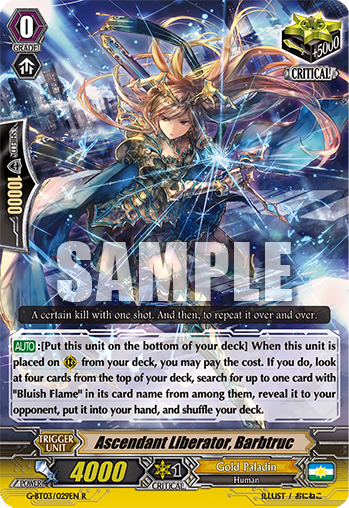 The first print of G-BT12/090EN had the incorrect text printed. (1st ability) If you do, this unit gets Power@+5000. (1st ability) If you do, this unit gets Power@+5000 until end of turn. 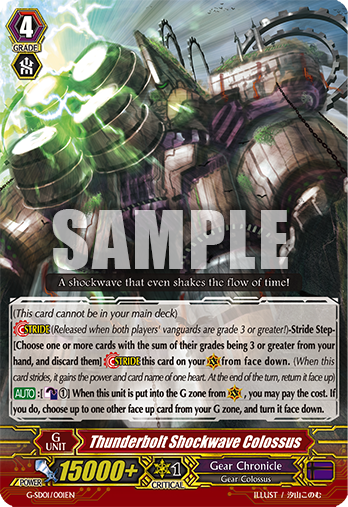 The first print of G-BT11/026EN, G-BT11/S15EN had the incorrect text printed. 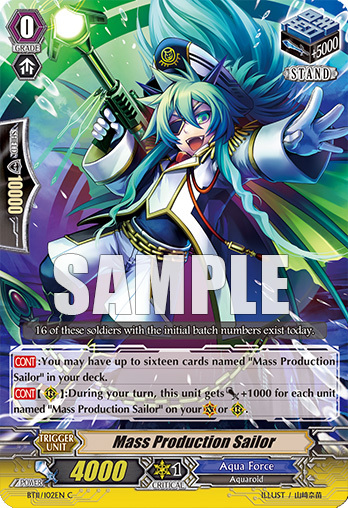 The first print of G-BT11/079EN had the incorrect text printed. The first print of G-CB05/009EN, G-CB05/S09EN had the incorrect text printed. The first print of G-CB05/001EN, G-CB05/S01EN had the incorrect text printed. The first print of G-CHB03/050EN had the incorrect text printed. The first print of PR/0191EN had the incorrect text printed. (Ability) During your turn, this unit gets [Power] +1000 for each 《Cray Elemental》 in your G zone. (Ability) During your turn, this unit gets [Power] +1000 for each face up 《Cray Elemental》 in your G zone. 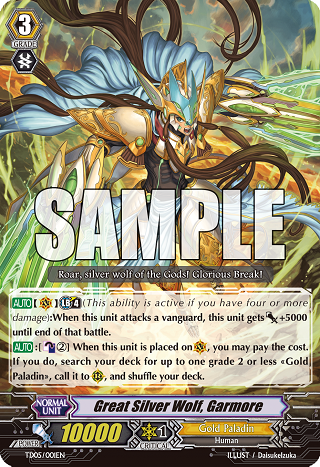 The first print of G-BT03/104EN had the incorrect text printed. The first print of G-TB01/011EN had the incorrect text printed. The first print of G-TB01/016EN had the incorrect text printed. The first print of G-TB01/027EN had the incorrect text printed. The first print of G-TCB02/029EN had the incorrect text printed. The first print of G-RC01/013EN had the incorrect text printed. The first print of G-RC01/031EN had the incorrect text printed. 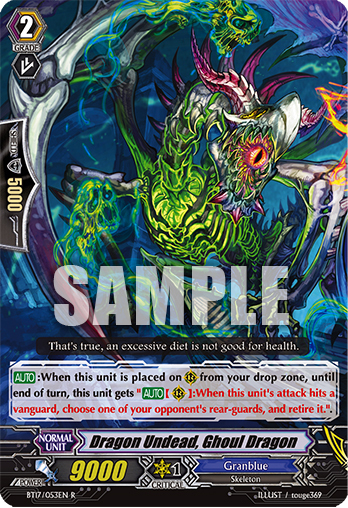 The first print of G-BT09/051EN had the incorrect text printed. 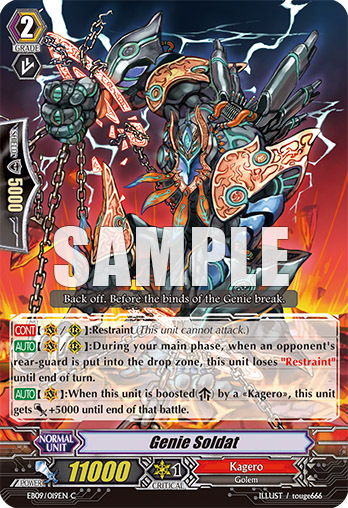 The first print of G-BT02/060EN had the incorrect text printed. The first print of G-BT09/003EN, S01EN had the incorrect text printed. The first print of G-BT09/047EN had the incorrect text printed. The first print of PR/0266EN had the incorrect text printed. The first print of G-CB04/001EN had the incorrect text printed. The first print of G-TD09/015EN had the incorrect text printed. 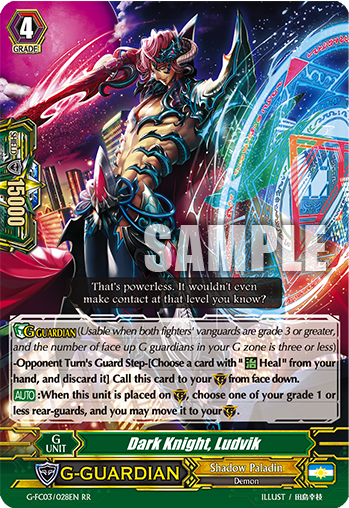 The first print of G-BT08/031EN had the incorrect text printed. The first print of G-TCB02/067EN had the incorrect text printed. The first print of G-TCB02/009EN & G-TCB02/S06EN had the incorrect text printed. The first print of G-TCB02/001EN had the incorrect text printed. The first print of "Brilliant Ocean, Elly" had the incorrect text printed. 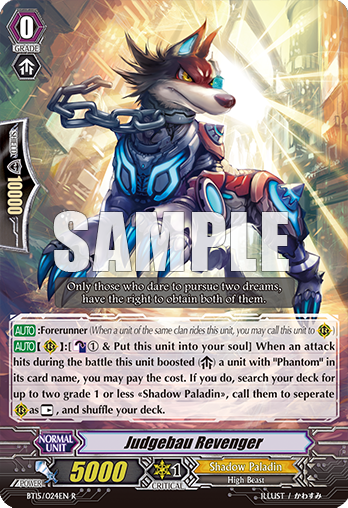 The first print of G-BT07/024EN had the incorrect text printed. The first print of G-FC01/017EN had the incorrect text printed. 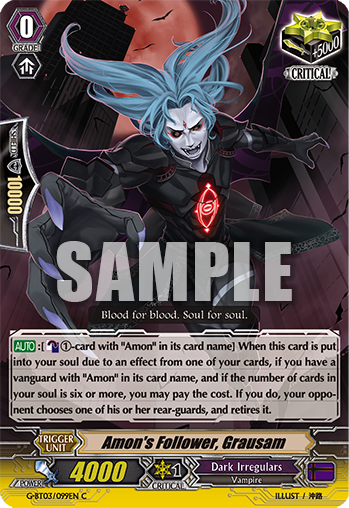 The first print of G-BT07/076EN had the incorrect text printed. 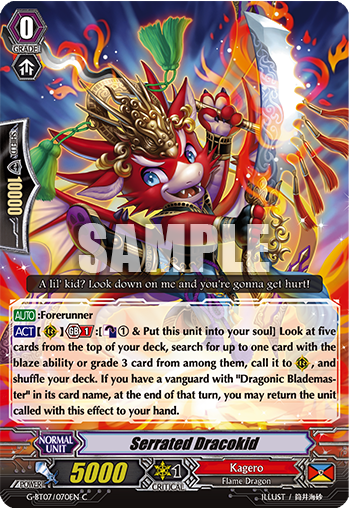 The first print of G-BT07/054EN had the incorrect text printed. The first print of BT13/005EN had the incorrect text printed. 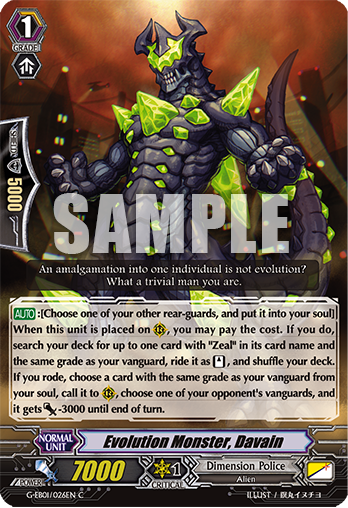 The first print of G-BT07/005EN had the incorrect text printed. 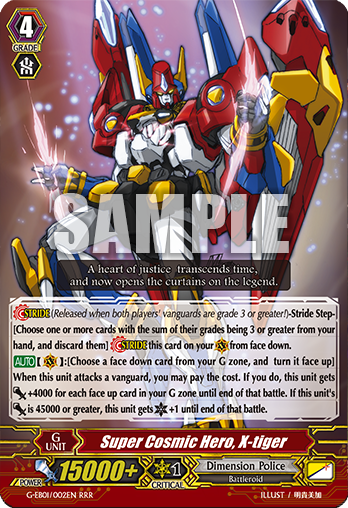 The first print of G-BT07/079EN had the incorrect text printed. The trigger icon's text was written as "STAND". The trigger icon's text should be written as "DRAW". The first print of G-BT07/083EN had the incorrect text printed. 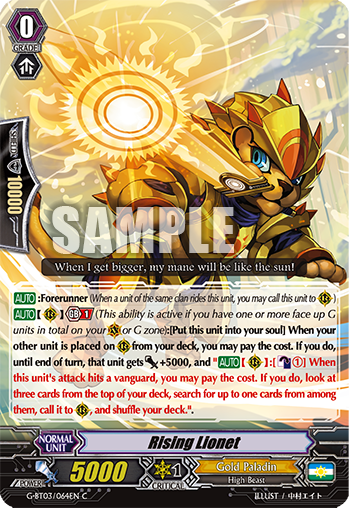 The first print of G-BT07/070EN had the incorrect text printed. The first print of G-FC03/028EN had the incorrect text printed. 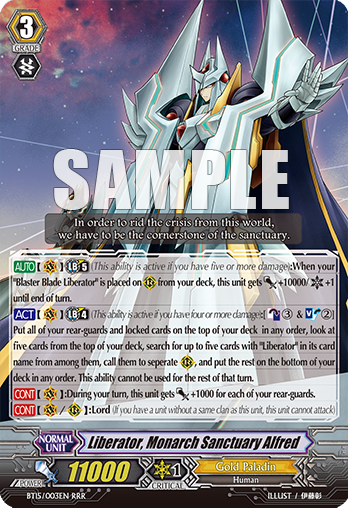 The first print of G-BT06/015EN had the incorrect text printed. The first print of G-TB01/031EN had the incorrect text printed. ...and turn it face up. ...and turn it face down. The first print of G-SD01/001EN had the incorrect text printed. The first print of G-FC02/024EN had the incorrect text printed. The first print of G-FC02/037EN and G-FC02/044EN had the incorrect text printed. The first print of G-CB02/011EN and G-CB02/S05EN had the incorrect text printed. The first print of G-TD03/006EN had the incorrect race printed. …and your opponent cannot call grade 0 cards from hand[Critical]to (GC). …and your opponent cannot call grade 0 cards from hand to (GC). The first print of G-CB02/S06EN had the incorrect text printed. …gains [Power] +5000 until end of turn.. The first print of BT17/029EN had the incorrect text printed. 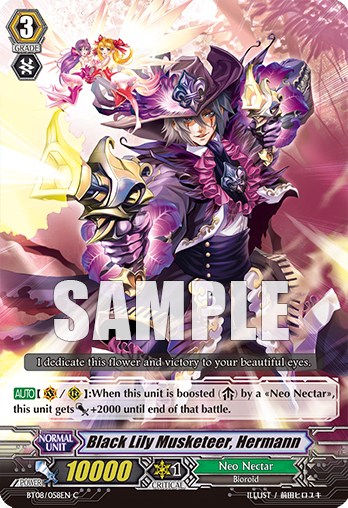 The first print of G-BT03/029EN had the incorrect text printed. 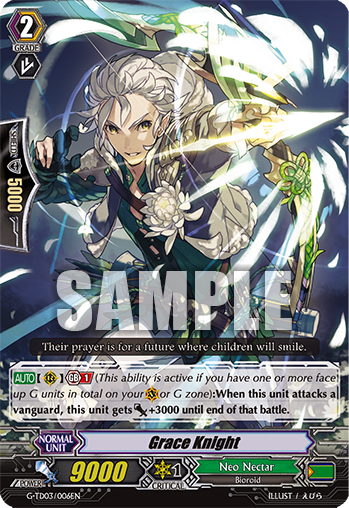 The first print of G-BT03/099EN had the incorrect text printed. The first print of EB10/001EN-B, EB10/001EN-W, EB10/S01EN-B & EB10/S01EN-W had the incorrect text printed. The first print of G-BT03/064EN had the incorrect text printed. 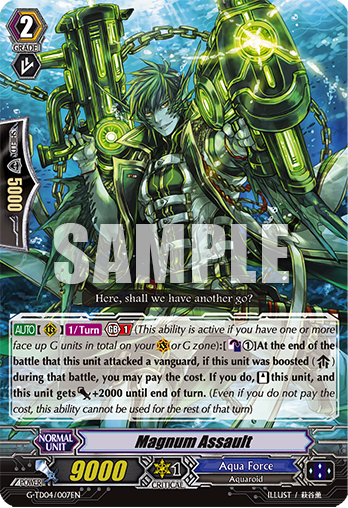 The first print of G-BT03/026EN had the incorrect text printed. The first print of G-LD01/001EN had the incorrect text printed. The first print of G-FC01/039EN had the incorrect text printed. The first print of PR/0112EN had the incorrect text printed. The first print of G-TD04/002EN had the incorrect text printed. The first print of G-TD04/007EN had the incorrect text printed. The first print of G-EB01/002EN had the incorrect text printed. …force through my own own line! …force through my own line! The first print of G-EB01/006EN had the incorrect text printed. The first print of G-EB01/026EN had the incorrect text printed. 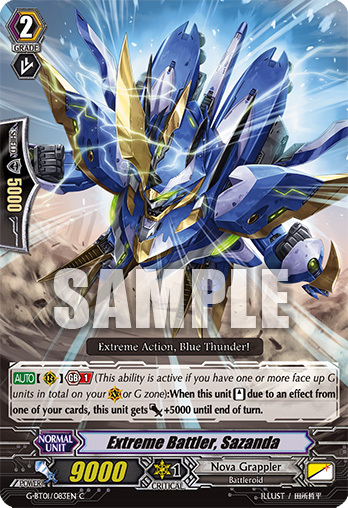 The first print of G-BT01/099EN had the incorrect text printed. …until end of that battle. 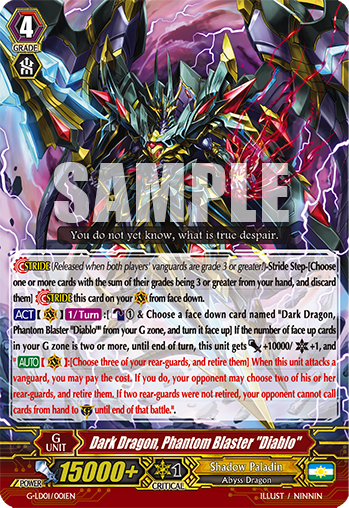 The first print of G-BT01/083EN had the incorrect text printed. The first print of G-TD03/002EN had the incorrect text printed. …get [Power] +5000. Shuffle your deck. …get [Power] +5000 until end of turn. Shuffle your deck. The first print of G-TD03/019EN had the incorrect text printed. Error: [AUTO]:When your unit is placed… ↓ Correct: [AUTO]:When this unit is placed… Reason for correction: The first print of BT17/053EN had the incorrect text printed. * This misprint will be corrected in the subsequent reprint(s) of this product. Error: …card name in the back row of the same column… ↓ Correct: …card name in the same column… Reason for correction: The first print of BT17/093EN had the incorrect text printed. * This misprint will be corrected in the subsequent reprint(s) of this product. Error (Clan): Shadow Paladin ↓ Correct (Clan): Royal Paladin Reason for correction: The first print of BT16/L02EN had the incorrect text printed. * This misprint will be corrected in the subsequent reprint(s) of this product. Error: …[Stand] during your opponenta’s next stand phase. ↓ Correct: …[Stand] during your opponent’s next stand phase. Reason for correction: The first print of PR/0139EN had the incorrect text printed. Error: …if this unit is [Legion], this unit gets [Power] +5000/[Critical] +1. This ability cannot be used for the rest of that turn…. ↓ Correct: …if this unit is [Legion], this unit gets [Power] +5000/[Critical] +1 until end of turn. This ability cannot be used for the rest of that turn…. Reason for correction: The first print of EB12/005EN had the incorrect text printed. * This misprint will be corrected in the subsequent reprint(s) of this product. 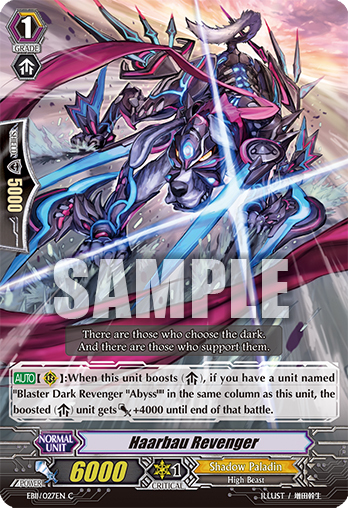 Error: …if you have a unit named “Blaster Blade Revenger “Abyss”" in the same column as this unit,… ↓ Correct: …if you have a unit named “Blaster Dark Revenger “Abyss”" in the same column as this unit,… Reason for correction: The first print of EB11/027EN had the incorrect text printed. * This misprint will be corrected in the subsequent reprint(s) of this product. Error: There was no Critical at the bottom of the card. ↓ Correct: This card has 1 Critical. Reason for correction: The first print of TD14/008EN had the incorrect text printed. * This misprint will be corrected in the subsequent reprint(s) of this product. Error: …Look at two cards from the top of your deck, search for up to two cards from among them, call them to separate open (RC), this unit gets [Power] +5000 until end of turn,… ↓ Correct: …Look at two cards from the top of your deck, search for up to two cards from among them, call them to separate open (RC), those units gets [Power] +5000 until end of turn,… Reason for correction: The first print of FC02/007EN had the incorrect text printed. * This misprint will be corrected in the subsequent reprint(s) of this product. Error: …any order, look at up to five cards from the top of your deck,… ↓ Correct: …any order, look at five cards from the top of your deck, … Reason for correction: The first print of BT15/003EN & BT15/S03EN had the incorrect text printed. * This misprint will be corrected in the subsequent reprint(s) of this product. 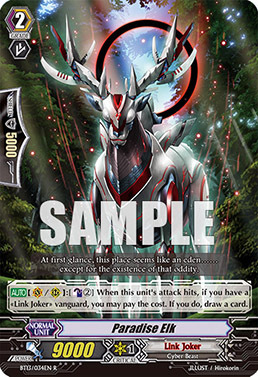 Error: …When an attack hits a vanguard during the battle this unit… ↓ Correct: …When an attack hits during the battle this unit, … Reason for correction: The first print of BT15/024EN had the incorrect text printed. * This misprint will be corrected in the subsequent reprint(s) of this product. 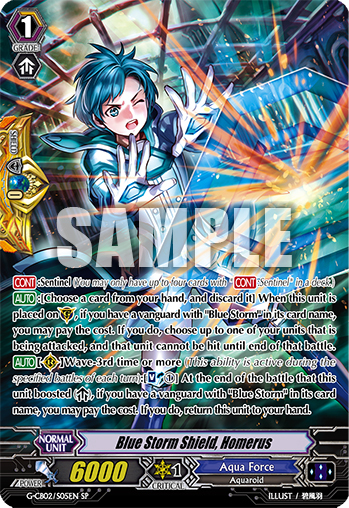 Error: The first print of BT15/054EN Physical Force Liberator, Zorron has the 2nd rear-guard circle icon in the wrong position. Reason for correction: The first print of BT15/054EN had the incorrect text printed. * This misprint will be corrected in the subsequent reprint(s) of this product. Error: … It turns face up at end of the owner’s turn.) ↓ Correct: … It turns face up at end of the owner’s next turn.) Reason for correction: The first print of BT13/081EN had the incorrect text printed. * This misprint will be corrected in the subsequent reprint(s) of this product. 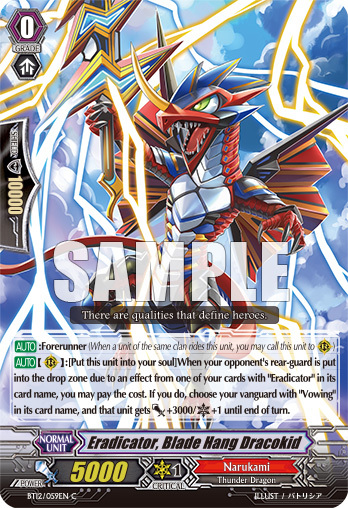 Error: … “Eradcator” in its card name, choose… ↓ Correct: … “Eradcator” in its card name, you may pay the cost. If you do, choose… Reason for correction: The first print of BT12/059EN had the incorrect text printed. * This misprint will be corrected in the subsequent reprint(s) of this product. Error: [AUTO] (VC/RC):[Counter-Blast 1]During your main phase…… ↓ Correct: [AUTO] (VC/RC):During your main phase……. Reason for correction: The first print of EB09/019EN had the incorrect text printed. * This misprint will be corrected in the subsequent reprint(s) of this product. Error: …except for the existance of that oddity. ↓ Correct: …except for the existence of that oddity. Reason for correction: The first print of BT13/034EN had the incorrect text printed. * This misprint will be corrected in the subsequent reprint(s) of this product. Error: …and the number of cards in your opponent’s hand is three or less, you may pay the cost. ↓ Correct: …and the number of cards in your opponent’s hand is three or more, you may pay the cost. Reason for correction: The first print of BT13/034EN had the incorrect text printed. * This misprint will be corrected in the subsequent reprint(s) of this product. 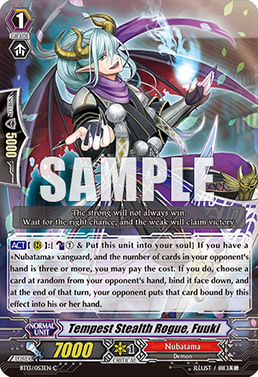 “BT12/004EN, BT12/S04EN Demon Conquering Dragon, Dungaree “Unlimited”"
Error: …retire it, and during your turn, this unit gets Power+2000 for each 《Narukami》 in your bind zone. 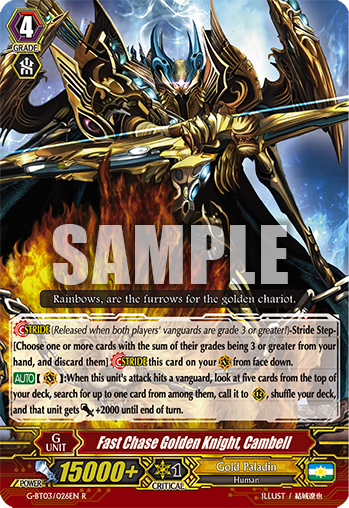 ↓ Correct: …retire it, and this unit gets Power+2000 for each 《Narukami》 in your bind zone until end of turn. Reason for correction: The first print of BT12/004EN, BT12/S04EN had the incorrect text printed. * This misprint will be corrected in the subsequent reprint(s) of this product. Error: The mutant claws will tear throught space and time, and the world shall come apart at the seams. ↓ Correct: The mutant claws will tear through space and time, and the world shall come apart at the seams. Reason for correction: The first print of BT12/063EN had the incorrect text printed. * This misprint will be corrected in the subsequent reprint(s) of this product. 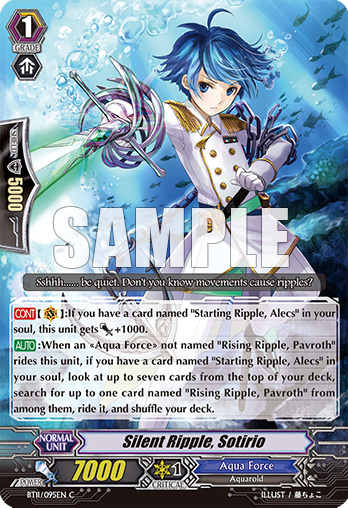 Error: …When an 《Aqua Force》 not named… ↓ Correct: …When a grade 2 《Aqua Force》 not named… Reason for correction: The first print of BT11/095EN had the incorrect text printed. * This misprint will be corrected in the subsequent reprint(s) of this product. Error: …for each unit named… ↓ Correct: …for each other unit named… Reason for correction: The first print of BT11/102EN had the incorrect text printed. * This misprint will be corrected in the subsequent reprint(s) of this product. 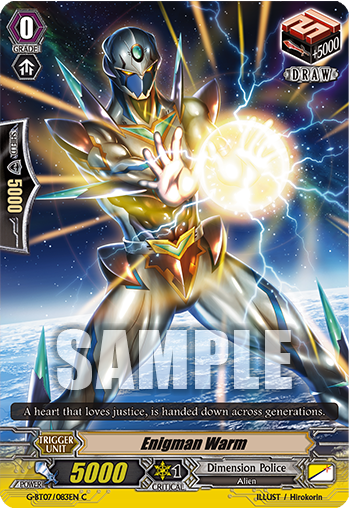 Error: Battleroid ↓ Correct: Bioroid Reason for correction: The first print of BT08/058EN has the incorrect race printed. * This misprint will be corrected in the subsequent reprint(s) of this product. 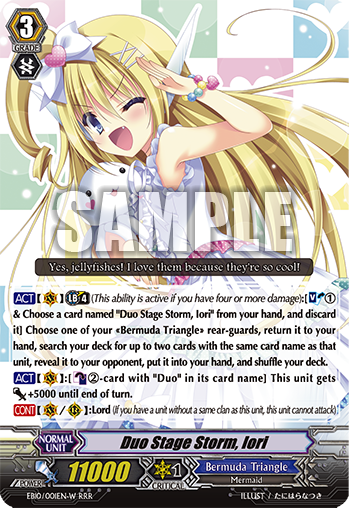 Error: AUTO:When another 《Bermuda Triangle》 rides this unit, you may call this card to (RC). ↓ Correct: AUTO:Forerunner (When a unit of the same clan rides this unit, you may call this unit to (RC)) Reason for correction: The corrections were made as the abilities can be classified under the “Forerunner” ability. FAQ regarding errata: Q. Can I still use the cards with the error text in official events or official tournaments? A. Yes, you can. But the card will be treated as if it were written in the correct text. Q. I have a card with the error text. Can I use it in the way before the errata was rectified? A. No, you cannot. Since the card has been declared as an errata, it will be treated as having the amended text even if the text before rectification is printed on the card. 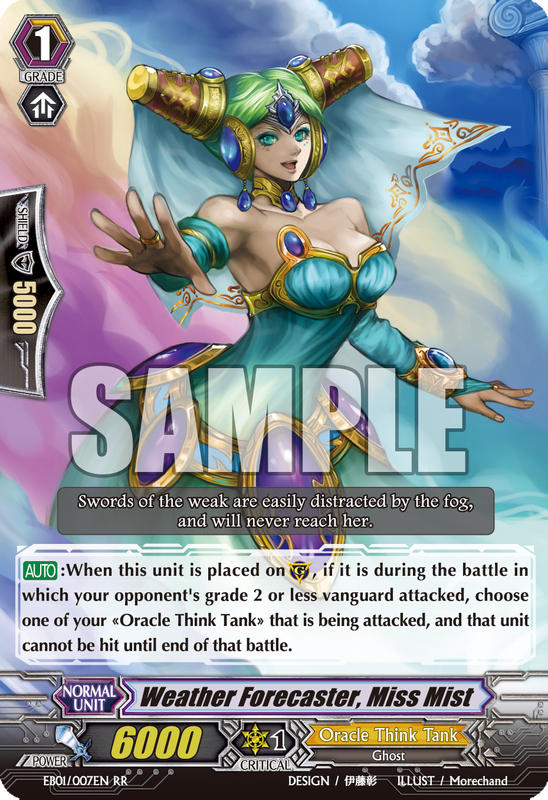 Error: AUTO: When this unit is placed on (GC), if it is during the battle in which your opponent’s grade 2 or less vangaurd attacked, choose one of your 《Oracle Think Tank》 that is being attacked, and that unit cannot be hit until end of that battle. 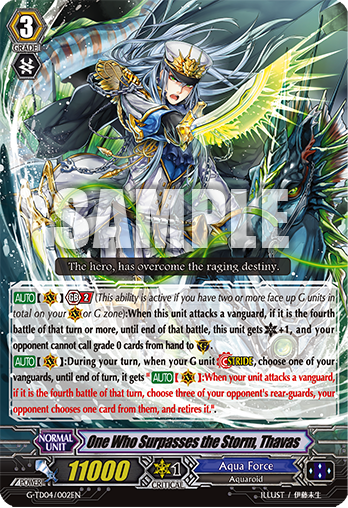 Correct: AUTO: When this unit is placed on (GC), if it is during the battle in which your opponent’s grade 2 or less vanguard attacked, choose one of your 《Oracle Think Tank》 that is being attacked, and that unit cannot be hit until end of that battle. Error: AUTO:[Choose a <clan name> from your hand, and discard it] When this unit is placed on (GC), you may pay the cost. If you do, choose one of your <clan name> that is being attacked, and that unit cannot be hit until end of that battle. 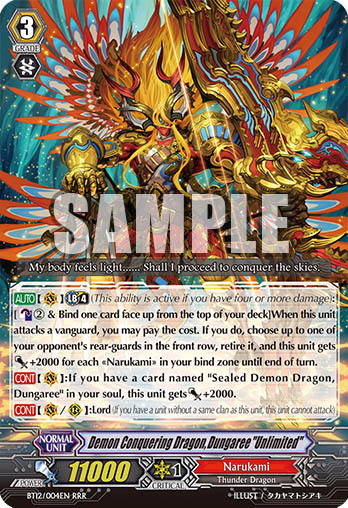 ↓ Correct: CONT:Sentinel (You may only have up to four cards with “CONT:Sentinel” in a deck.) AUTO:[Choose a <clan name> from your hand, and discard it] When this unit is placed on (GC), you may pay the cost. If you do, choose one of your <clan name> that is being attacked, and that unit cannot be hit until end of that battle. *Replace <clan name> with the respective clan names. 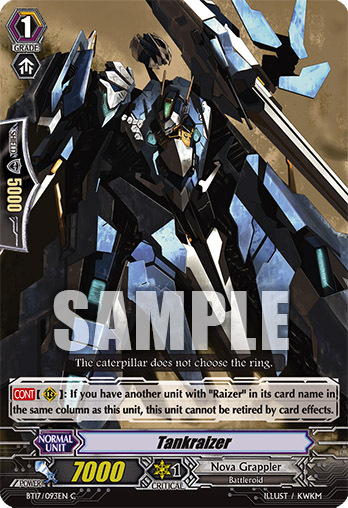 Example: BT06/017EN　Halo Shield, Mark Error: AUTO:[Choose a 《Gold Paladin》 from your hand, and discard it] When this unit is placed on (GC), you may pay the cost. If you do, choose one of your 《Gold Paladin》 that is being attacked, and that unit cannot be hit until end of that battle. 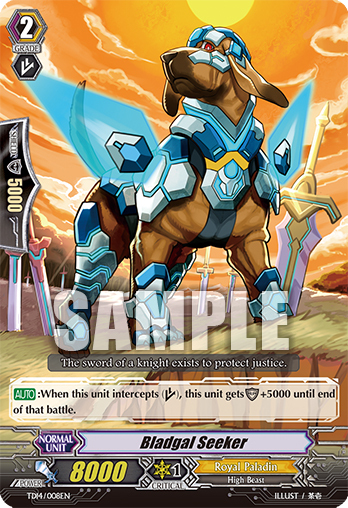 ↓ Correct: CONT:Sentinel (You may only have up to four cards with “CONT:Sentinel” in a deck.) AUTO:[Choose a 《Gold Paladin》 from your hand, and discard it] When this unit is placed on (GC), you may pay the cost. If you do, choose one of your 《Gold Paladin》 that is being attacked, and that unit cannot be hit until end of that battle. Reason for correction:	The corrections were made to create an even more interesting fight environment. FAQ regarding errata:	Q. Can I still use the cards with the error text in official events or official tournaments? A. Yes, you can. But the card will be treated as if it were written in the correct text. Q. I have a card with the error text. Can I use it in the way before the errata was rectified? A. No, you cannot. 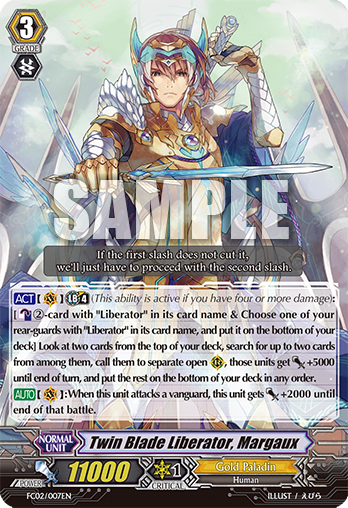 Since the card has been declared as an errata, it will be treated as having the amended text even if the text before rectification is printed on the card. 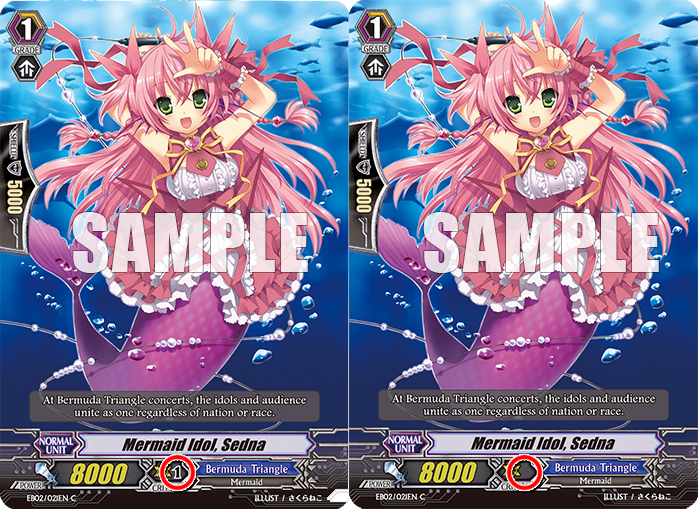 Error:	The first print of EB02/021EN Mermaid Idol, Sedna is missing the number “1″, after the Critical icon. Please note that the the card is supposed to deal 1 Critical as intended. * This misprint will be corrected in the subsequent reprint(s) of this product. 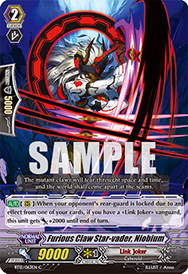 Error:	ACT【V】: Limit Break 4 (This ability is active if you have four or more damage): [Counter Blast (2)] Soul Charge (2), and this unit gets Power +1000 for each «Dark Irregulars» in your soul. 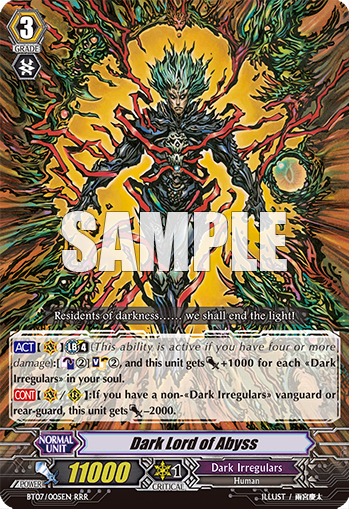 Correct:	ACT【V】: Limit Break 4 (This ability is active if you have four or more damage): [Counter Blast (2)] Soul Charge (2), and this unit gets Power +1000 for each «Dark Irregulars» in your soul until the end of your turn. Error:	[Auto]：[Choose a 《Clan Name》 from your hand, and discard it] When this unit is placed on (GC), you may pay the cost. If you do, your 《Clan Name》 cannot be hit until end of that battle. 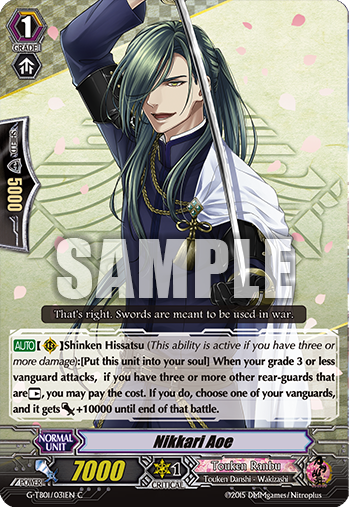 Correct:	[Auto]：[Choose a 《Clan Name》 from your hand, and discard it] When this unit is placed on (GC), you may pay the cost. If you do, choose one of your 《Clan Name》 that is being attacked, and that unit cannot be hit until end of that battle. * All reprints have been printed in the correct text. Reason for correction:	The previous wording could lead to a misunderstanding of the ability. FAQ regarding errata:	Q. Can I still use the cards with the error text in tournaments? A. Yes, you can. But the card will be treated as if it were written in the correct text. Error:	[Auto]:[Counterblast 2] When this unit is placed on the “Vanguard Circle”, you may pay the cost. If you do, search your deck for up to one grade 2 or less <<Gold Paladin>>, call it to the “Rear-guard Circle”	and shuffle your library. 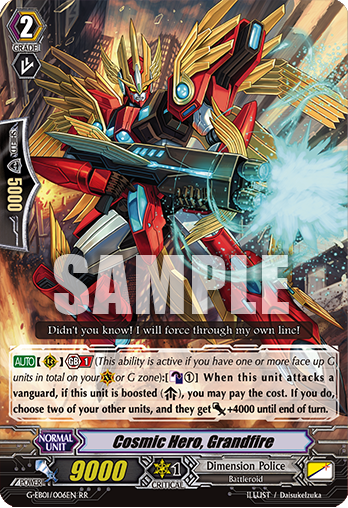 Correct:	[Auto]:[Counterblast 2] When this unit is placed on the “Vanguard Circle”, you may pay the cost. If you do, search your deck for up to one grade 2 or less <<Gold Paladin>>, call it to the “Rear-guard Circle”	and shuffle your deck. * This misprint will be corrected in the subsequent reprint(s) of this product.